This is the earliest known photo of me with a control line airplane - a Cox PT-19 Trainer. I'm guessing it was summer of 1969, when I would have been 12 to 13 years old (my birthday is August 18, so it could have been before or after). I remember that 1969 was the year because it was the year that Hurricane Camille tore up Biloxi, Mississippi (where I would many years later be stationed for electronics training in the USAF) and the rains even in Mayo, Maryland, where I lived, were torrential. 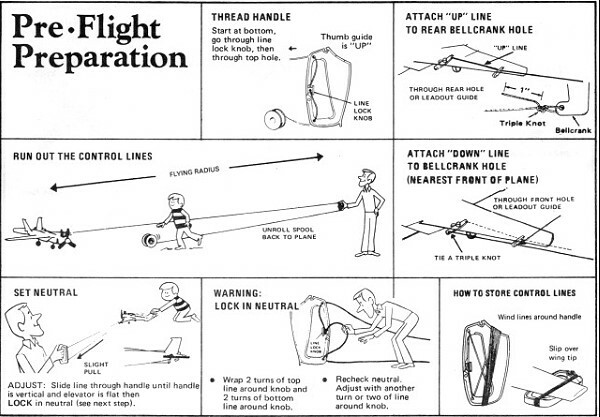 It is the airplane with which I first learned to fly control line. 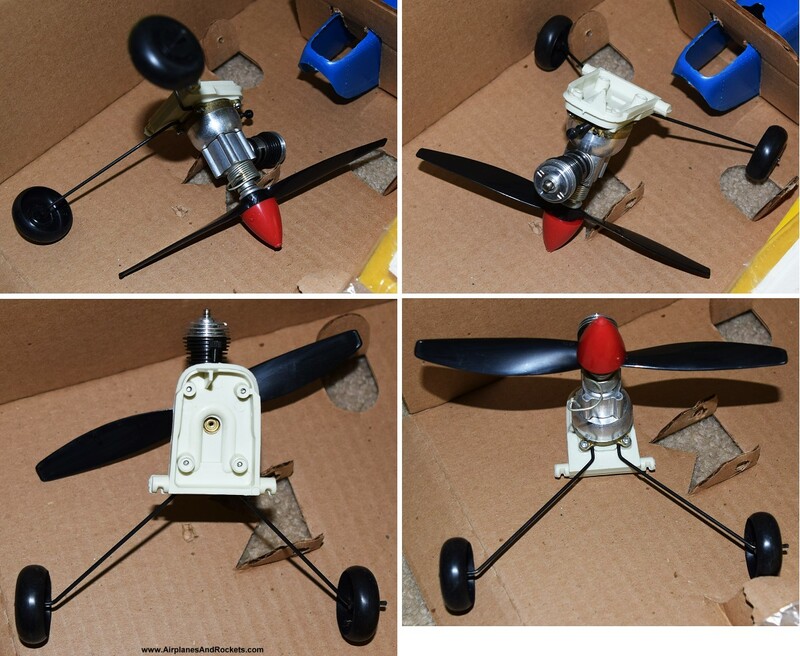 There was another Cox control line plane that I had prior to the PT-19 Trainer, but I cannot recall what it was; all I know is that I demolished it after a couple attempts at flying. There was nobody around that I knew of who could teach me to fly, so I had to do it on my own. 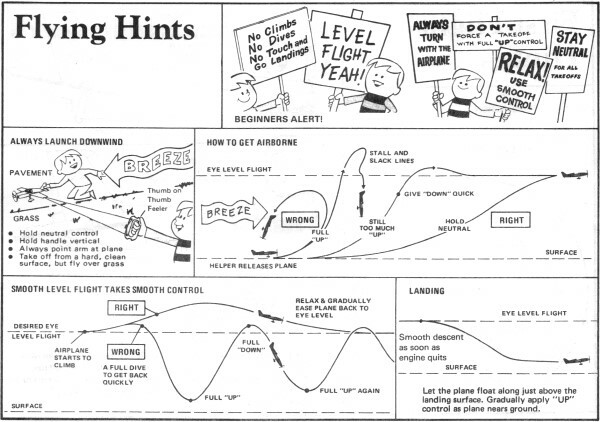 The same thing was true later on when I learned to fly radio control airplanes. 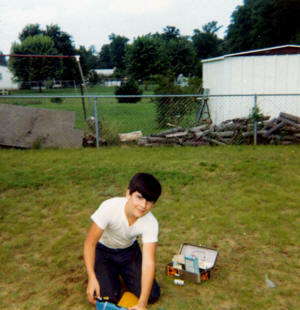 You can see in the photo that my field box was a metal one that was sold by Estes for rockets. The Cox 25% nitro fuel can is sitting in the box. 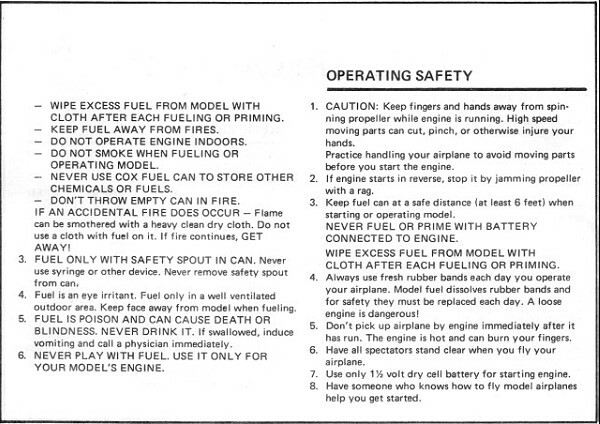 Undoubtedly, there are a couple rocket engines sitting in there too, along with some recovery wadding, igniters, and probably even matches (safety was not at the top of my list back then). 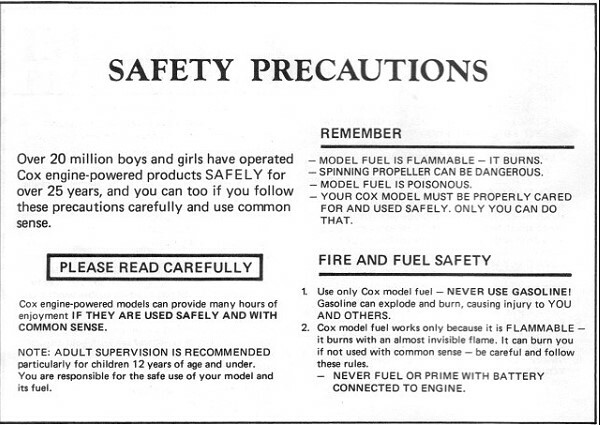 I was probably using the battery that was part of the Cox Starter Kit. 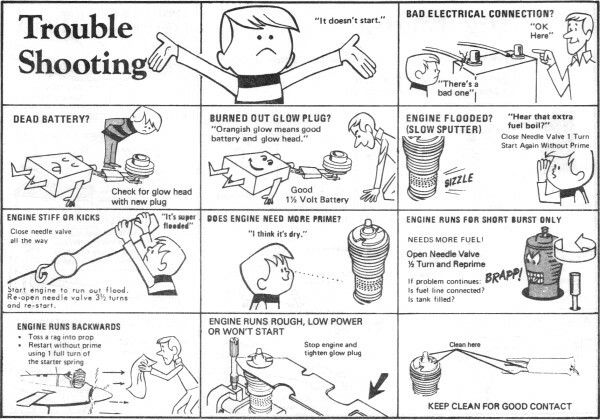 Those things never lasted very long, and I'd kneel while flipping over the Cox .049 seemingly endlessly, praying for the engine to start. 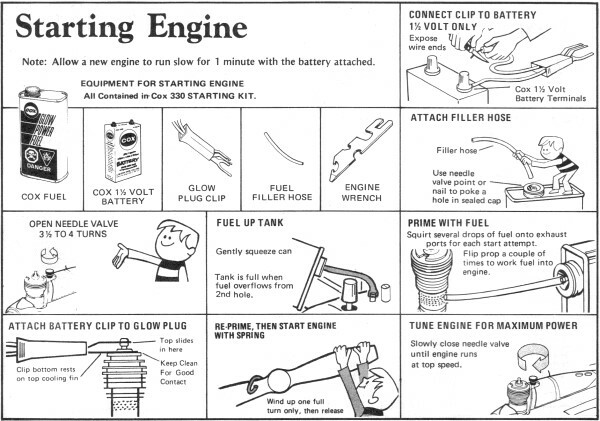 Oh, for a good battery and an electric starter in those days! 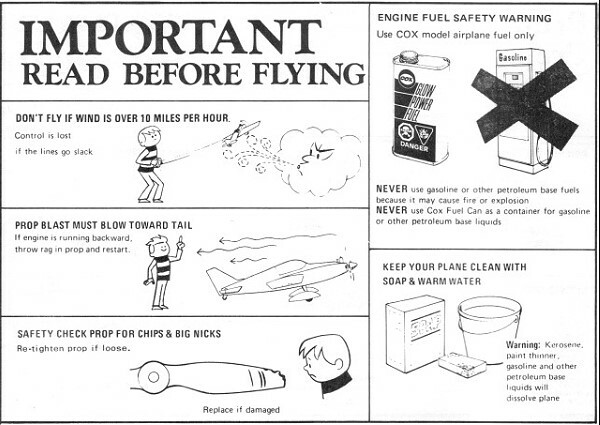 My method for being successful at flying this Cox PT-19 Trainer was fairly simple. I cut the control lines to be about 4 or 5 feet long - just enough that if I stretched my arms over my head and stood on my tiptoes the pane could not hit the ground. 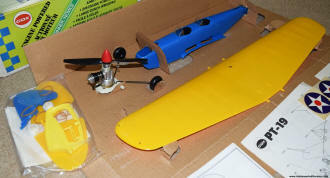 Then, I adjusted the Cox .049 engine to run as slowly as it would go. 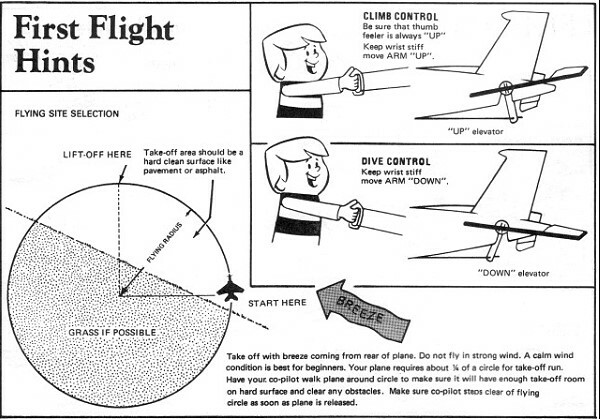 I gained proficiency at basic elevator control that way (rather than doing what most dummies - including myself - typically do and hold full up elevator until the plane works itself into a wingover straight into the ground). Once I was comfortable with that line length and engine setting, I would lengthened the lines a bit and fly a few more circuits. Within a half an hour I was comfortably flying with full length lines and full speed on the engine. I wish I had thought of that on the first airplane. Our house was at 114 River Road (originally Rt. 4 Box 504 until the post office changed it), Edgewater, Maryland (actually in Mayo, but we had an Edgewater P.O. box). The next-door neighbors whose yard is shown in the picture were the Pearsons': Chuck (my age), Debbie (Gayle's age), Theresa, Shirley, and Whip (can't remember his real name). Oh, and their parents were Mr. and Mrs. Pearson ;-) They moved to another house in the neighborhood a few years after this picture, then to Florida, then to Tennessee. I'm not sure where they are today. As part of my endeavor to reacquire some of the models that I had as a kid (airplanes and rockets), I bid for and won this Cox PT-19 Trainer off of eBay. It is pictured above to the right, in brand-new condition. Unfortunately, I decided to sell it a couple years later during a pending move. However, I was able to get a replacement from the same era from a nice lady in British Columbia, Canada. 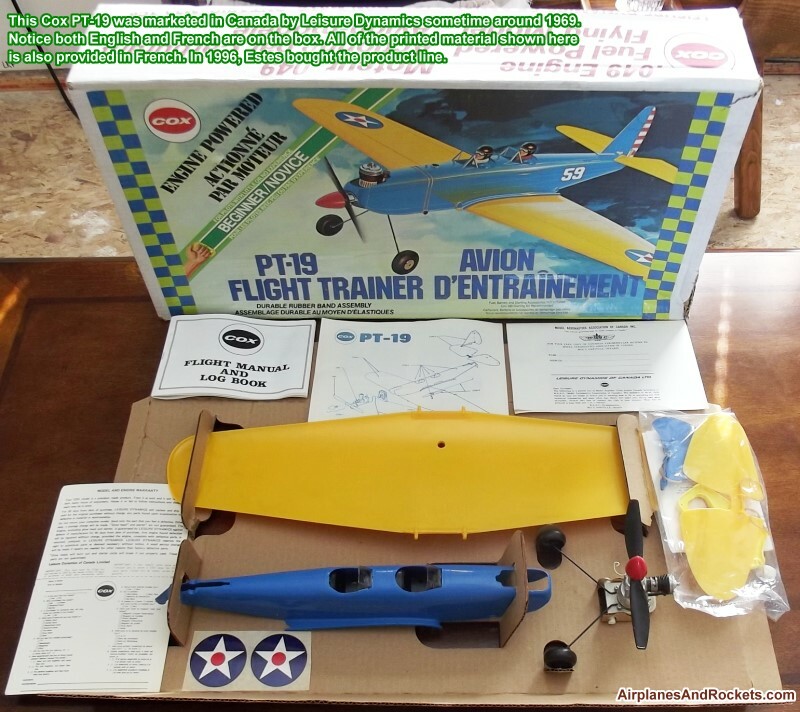 The new Cox PT-19 was marketed in Canada by Leisure Dynamics sometime around 1969, and the box was unopened when she contacted me about selling it. 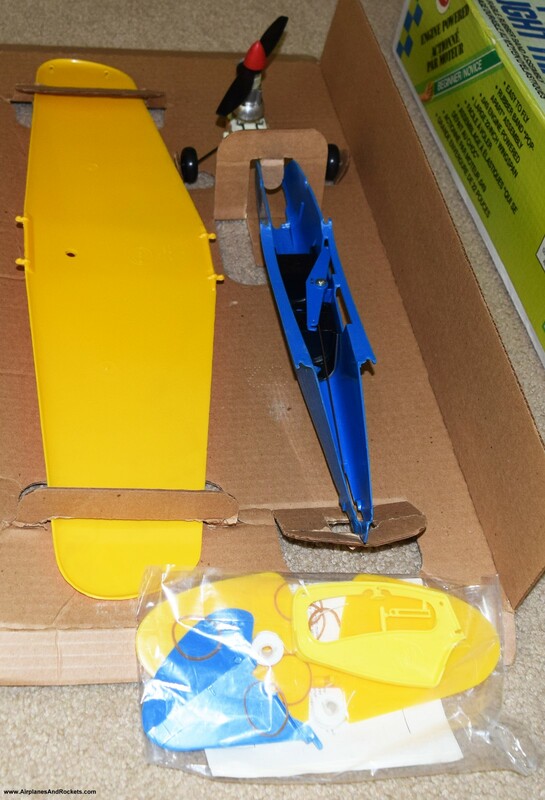 The box and contents are in absolutely pristine condition! This Cox PT-19 was marketed in Canada by Leisure Dynamics sometime around 1969 (right about the time I got my PT-19). 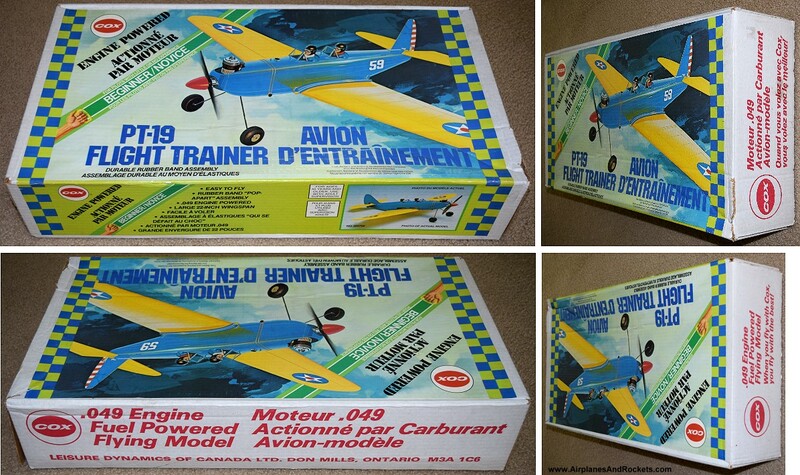 Notice both English and French are on the box. All of the printed material shown here is also provided in French. In 1996, Estes bought the product line. 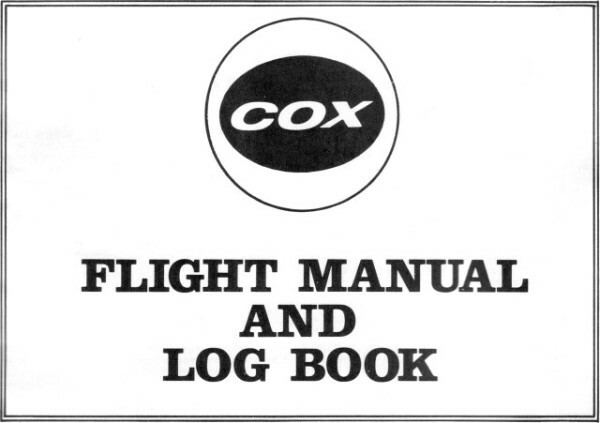 Below are pages from the Cox Flight Manual and Log Book that came with the PT-19. It was not unique to the PT-19, but came with all their control line models at the time. 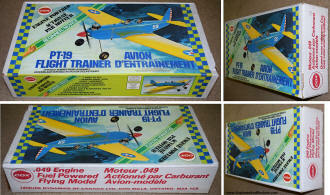 There was also a version supplied in French since the model was sold in Canada.